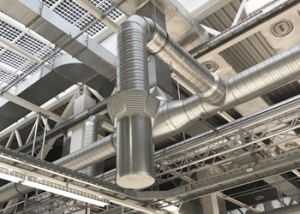 LTGs new air diffuser ILQsf System SmartFlow for industrial use was presented first time on the ISH 2017 exhibition in Frankfurt, Germany. 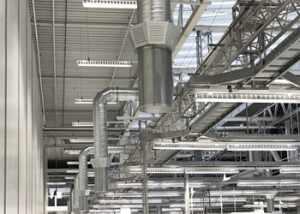 The “ILQsf“ System SmartFlow from LTG Aktiengesellschaft (Stuttgart) is a new diffuser for ceiling or floor mounting for industrial buildings, business premises, foyers and similar spaces. It is suitable for both heating and cooling operation, and allows variable flow rates while effectively keeping pollutants out of the frequented area even with a minimal supply air flow rate. To do so, the diffuser combines a mixed and a displacement air diffuser. A regulator element is positioned between these two diffusers. The mixed diffuser distributes around 25% of the maximum quantity of supply air radial over eight individual jets. The supply air exits the cylindrical part of the diffuser pulsed at a slow speed as displacement air, so that a stable laminar flow is produced. In comparison to a pure displacement air diffuser the result is a uniform penetration depth and layer size largely independent of the current flow rate. 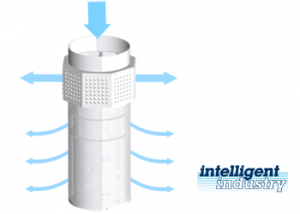 Thanks to the induction effect of the mixed air, harmful substances are effectively dissipated even at one fifth of the maximum possible flow rate. The ILQsf is available in three sizes for air flow rates of up to over 7,000 m³/h.